As a prerequisite to becoming an "Authorized Vendor" to OK Tire Stores, a NT-130 Nitrogen Tire Filling Station was installed and subjected to rigorous testing at the OK Tire Corporate Store in Abbotsford, B.C. This rigorous testing included a comparison of the NT-130 with the four year old Nitrogen Generator already in service. 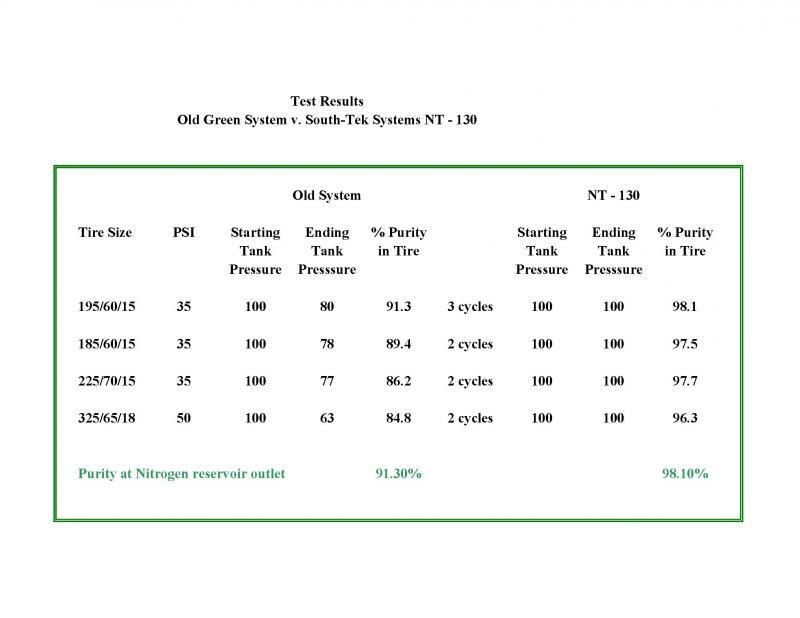 The NT-130 out performed the existing unit by a substantial margin, as can be seen in the following chart, prepared by OK Tire personnel. As a result of this test, OK Tire's management elected to replace the old unit with the NT-130, in part on the unit's ability to maintain a high degree of purity, no matter what load was placed on it, and it ability to maintain pressure at all times. One of the deciding factors, in making this decision to replace the existing generator with the NT-130, was its ability to set the bead on most passenger vehicle tires, right on the tire machine, and complete a Nitrogen fill in one pass. This ability significantly reduces the time spent servicing a tire. A time consuming "double purge and fill is not required, to provide a high quality fill.
" Greening the Earth - One Mile at a Time "